We've all seen the TV and newspaper adverts about not using your phone while driving – a second of distraction can so easily lead to disaster. But I think there’s something else that is almost as distracting – for me anyway – a GPS device. How much concentration does it take to follow a map on your GPS? If you drive a larger vehicle or you normally wear glasses it’s even more difficult to see what’s on that small screen. Thankfully, GPS screens are getting bigger. 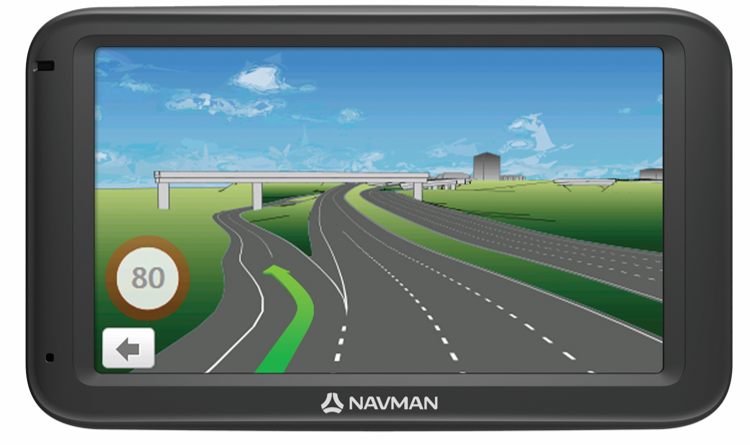 Navman have just launched 5 inch and 7 inch models in their EZY range – with a simple layout that anyone can use easily. Both devices feature free lifetime map updates, including safety alerts, warnings about traffic congestion, speed limits, speed or safety cameras, school zones and accident blackspots. They can even help you find the closes service station that serves your particular fuel type. Both models are available now - the 5 inch model EZY255LMT is $169 and the 7 inch EZY270LMT is $279. I get lots of questions about Windows 8.1 (the latest versions of Windows 8). I think I've found the perfect way to answer those questions and create a place where anyone can refer to if they need help. I have been offered and accepted a wonderful new position at the college where I have been teaching computer skills for the past six years. 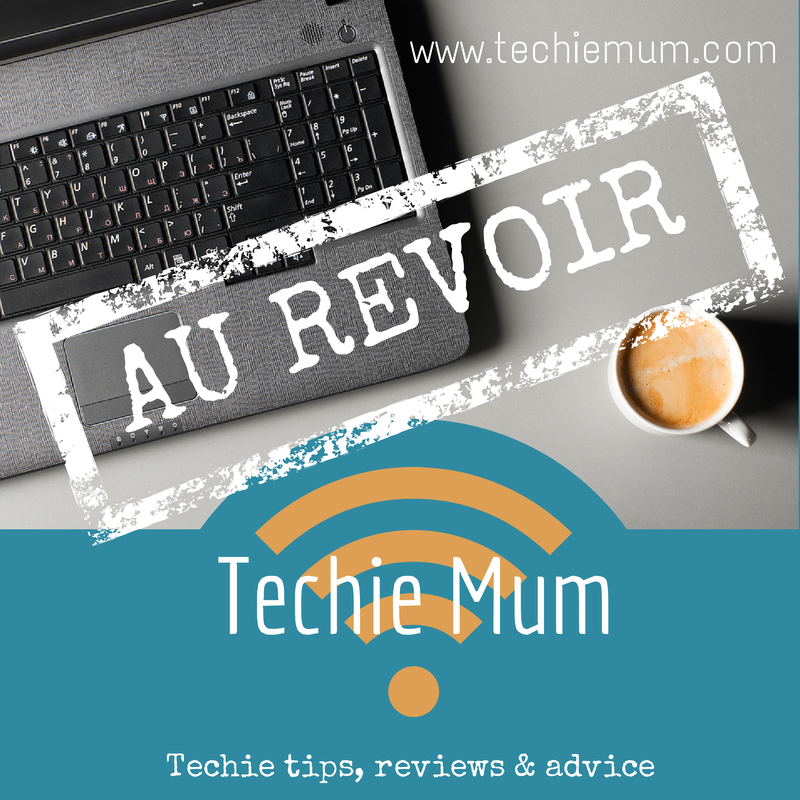 My new job started this week, and the time I need to dedicate to it means that I will no longer be writing as regularly for Techie Mum. At this stage I'm not sure how often I will be able to post, but I'm planning that with the reduction in quantity there will be an increase in quality. 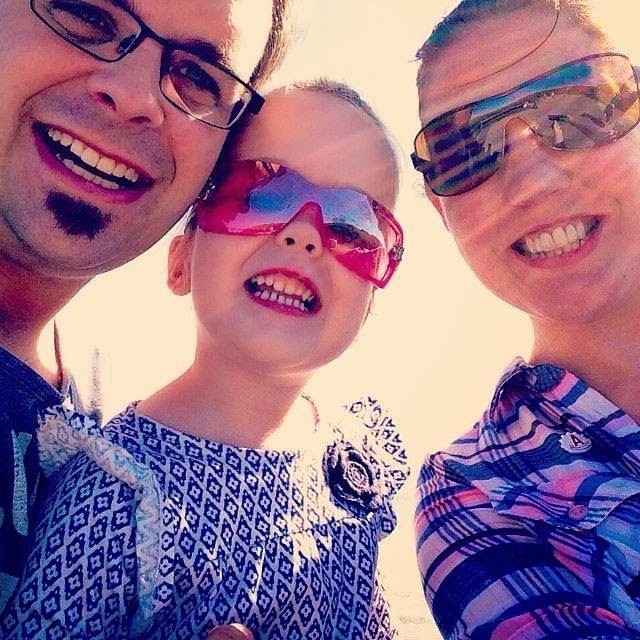 There are so many others writing about social media and blogging, so I will no longer be contributing on those topics. 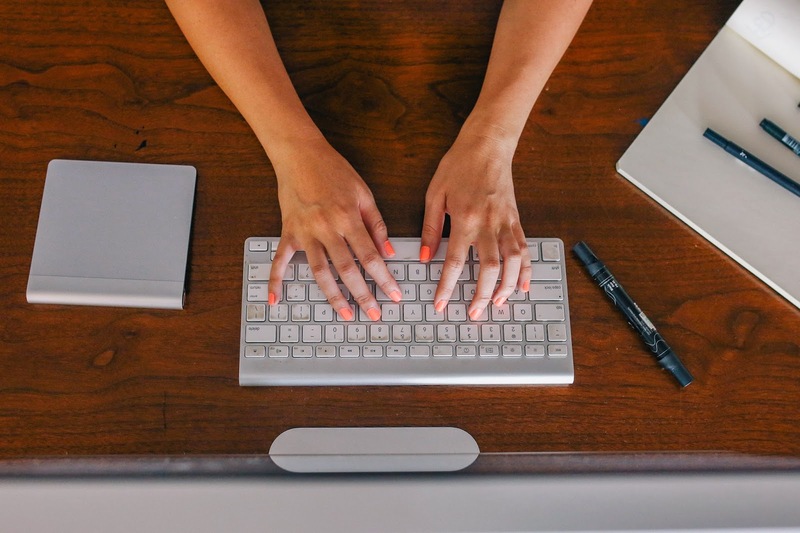 I'm going back to writing for my original audience – my students and families in need of help with technology. I will be writing more instructional posts and how-to guides that I hope my readers will find useful. 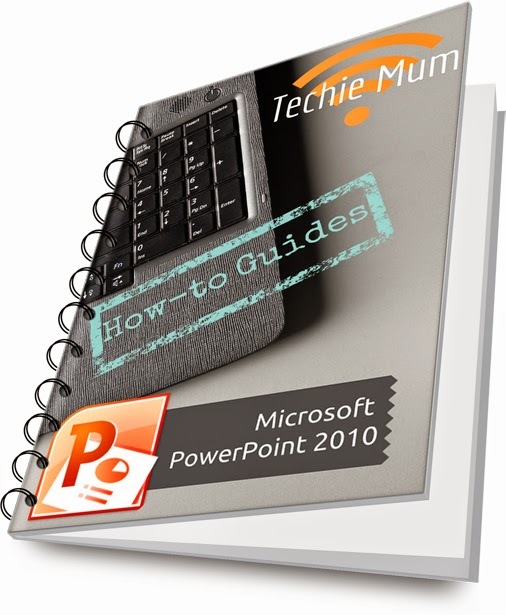 I have really enjoyed writing about technology for the past two and a bit years, and while I will probably disappear from your Facebook News Feed, I hope you will still visit Techie Mum when you need a techie fix. Those of you who know me know that my boys are no longer babies, so you might be wondering why I'm reviewing a baby monitor. I do know that a lot of my readers DO have babies, so when I was offered the D-Link Wi-Fi Baby Camera to trial and review, I thought it might be something of interest, and I had some ideas for other uses for it too. Don’t run away if you don’t have a baby – read to the end and you’ll see how this camera is a lot more than a baby monitor! When you first unpack it, the D-Link Wi-Fi Baby Camera looks like a large webcam. 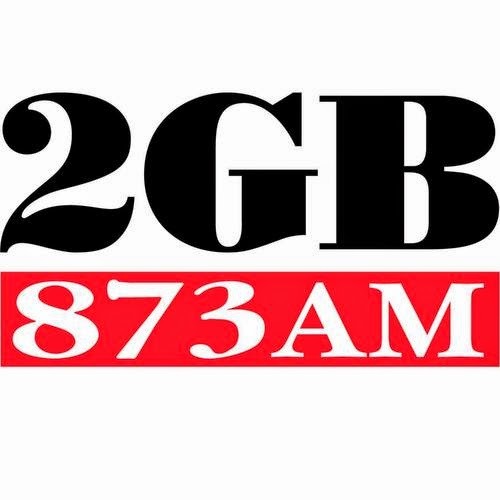 Just plug it in to the power, download the app to your phone or tablet (it’s available for iOS and Android) and you’re guided through the Setup Wizard. The camera has its own Wi-Fi code, which you enter into the app to link it to your phone or tablet, then you link the camera to your home Wi-Fi network. The whole set up took less than 10 minutes. The last step is to create an account with D-Link which means you can monitor the camera from anywhere in the world just by visiting the D-Link website and logging in. What’s so special about this baby camera? Rather than just hearing your baby you can see your baby. Distance isn't a problem - you can be in the living room, in the garden, or at your neighbours home. High definition vision quality means that even in a dark room you can still see up to 5 metres. 4 x digital zoom from your phone or tablet. There’s two way audio, which means that as well as listening to your baby, you can also talk to your baby. There’s even a lullaby player built in with five different tunes. Set it to alert you when motion or noise is detected, or when there’s a temperature change in the room. Insert a microSD card and record video or images. Both the blue and pink coloured rings come with the camera, so you can colour coordinate with your baby’s décor. This camera would be perfect for a parent who has to travel for work, or worse, who works/lives apart from their family for any length of time. I know for me, being away from my family is hardest at night, and luckily that didn’t happen when my boys were babies, but to have been able to see them tucked into their beds and sleeping would have at least assured me that everything was OK. Just log in to your camera via the D-link website and you view the camera images live, even from the other side of the world! Pet owners – do you have a pet who frets when you’re not there? You can talk to it via the camera, as well as checking that it’s not doing something it shouldn’t! A sick child at home and you have to work, or go to the shops? You can make sure they’re ok while you’re out. Recently my father spent his first night out of hospital with us. I wish I’d had the D-Link then, because if he needed something in the middle of the night, all he would have had to do was speak into the monitor. My parents still live in their own home and my father is the carer for my mother who has dementia. They live in a two storey house and twice so far my mother has fallen over while my father has been downstairs. With the D-Link camera set up he could have seen what was going on upstairs and heard my mother when she called for help. Luckily it’s a few years since I've had to worry about this, but lately there have been a few posts on other forums, so I know it’s an issue a few face. I once had a friend whose child delighted in tormenting one of my sons whenever they visited, but it was never when their mother was around, so she never saw what happened. If I’d had the D-Link baby camera then I would have had my iPad in our view wherever we were so we could both see exactly what he little ‘angel’ got up to out of her sight! Hide and seek/44 Homes changes completely when the camera is set up to monitor a strategic location, with the iPad left on a table where those ‘in the know’ could casually take a look. My boys love Prank Patrol on ABC3, so Aaron’s first thought was how to use the camera to prank his little brother! The two way audio was perfect for making his little brother and his friend think the house was haunted! He just hid the camera in Danny’s bedroom and spoke into my phone (and watched the results) from the other end of the house. I really don't suggest this one unless you want World War III - set up the camera behind your opponent while playing a card game and you can glance at your phone occasionally to see their hand! What would you use the D-Link Wi-Fi Baby Camera for? My boys have just about worn out the Lego Movie since I bought the DVD last week, and it has given their love of Lego a boost too. Which lead to the Lego apps on the iPad being discovered again. There are lots of great Lego apps for both iOS and Android, especially some new ones based on the Lego Movie, so it's worth taking a look at the app stores, especially if your feet need a break from the real stuff! For the older kids download the Lego Digital Designer to their computer and they can create without the need for actual bricks. In my review of the Samsung Galaxy S5 (here, if you missed it) I mention some of the apps I use to manage me, my family and my business. I've received a few questions about these apps and so I thought it was a good time to tell you about my favourites. I have all these apps on all my devices – my iPad, and two Android phones – and almost all of them either downloaded to my laptop, or accessible online from my laptop. This has been the biggest time saver I have ever used. 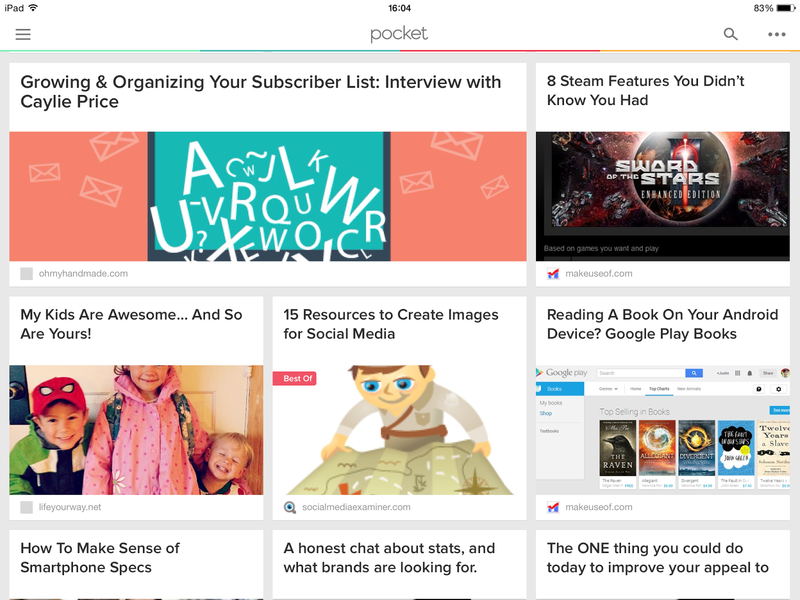 I use Pocket to store everything that I want to read later - email newsletters, web articles - anything. Pocket gets rid of all the extraneous stuff and keeps only the text and pictures from the web article, making it really easy to read. I can read them offline and add tags so I can search for the articles I need. Those that I want to keep I can send to Evernote. Pocket is on all my devices so that no matter where I am when I find something I want to keep I can add it to pocket, and I’ve always got something to read. 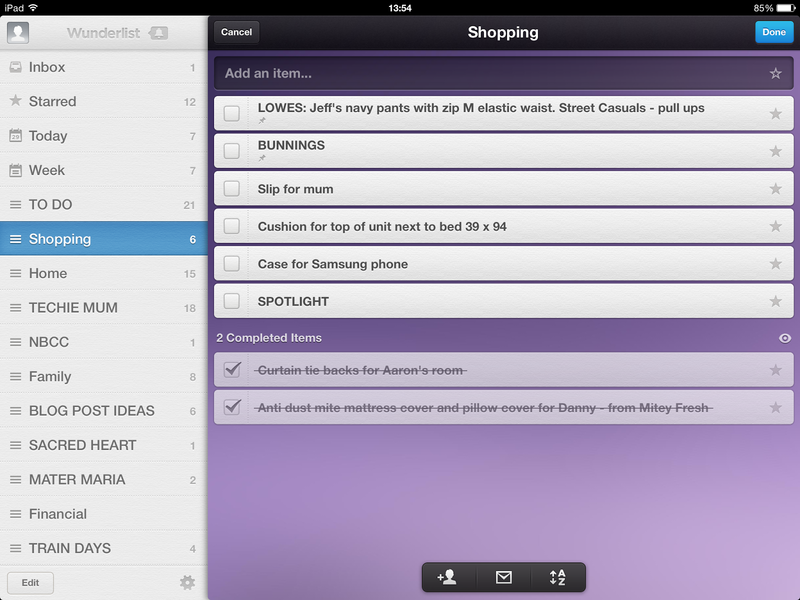 Evernote is an amazing organising tool. Similarly to Pocket, it can store articles and web clips and you can tag them to categorise them, but Evernote can do a lot more. You can add notes via audio (record your voice), webcam, screenshots, and handwritten notes, and even email directly to Evernote; and each note can be formatted – with checklists, tables etc. Create a filing system and folders within Evernote to organise your notes, and tags allow for cross-referencing across different categories. Evernote also has a family of products to help you do even more with Evernote. 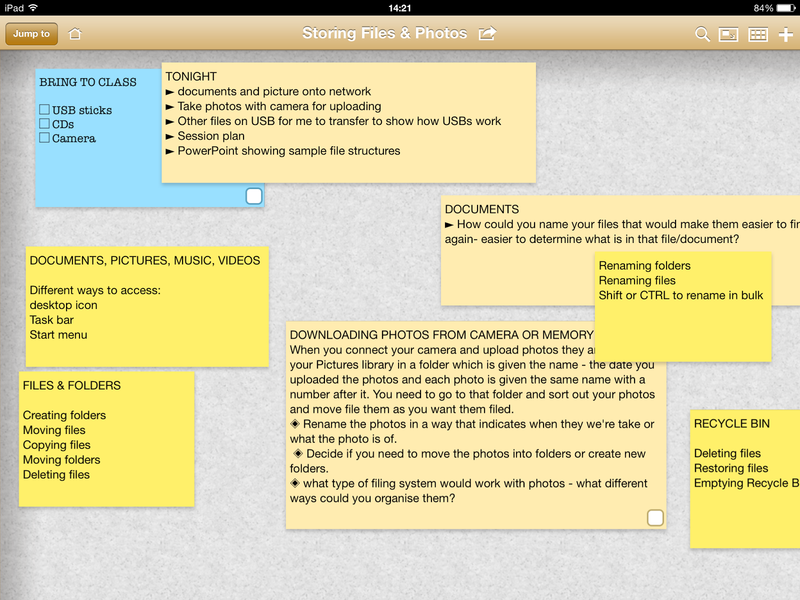 I use Skitch to add notes and marks to photos and screen shots (also great for PDFs). I also have Penultimate on my iPad which I use with a stylus when I want to take notes by hand. The pages of writing are automatically saved to Evernote. Lots of other apps also work with Evernote – I’ve got the Chrome extension to easily add any web clipping to Evernote; the Outlook add-in to quickly send an email to Evernote; JotNot on my iPad which turns it into a scanner with the scanned document sent straight to Evernote. This is my list manager - all my to do lists; what needs to be done in my business; in my home, in my life - everything. Items in each list can be given a deadline, and each item can have its own sub-lists. I can quickly refer to what needs to be done on a particular day and even print off the list for the day if I need it. Trello is where I manage my projects. Each project has a board and within that board I can break down the project into different stages. Within each stage I add the tasks to be completed. Each task can be dragged into a different spot - so important when you suddenly realise you've missed a step. Trello is on my laptop, iPad and Samsung phone so I can work on a project at any time. 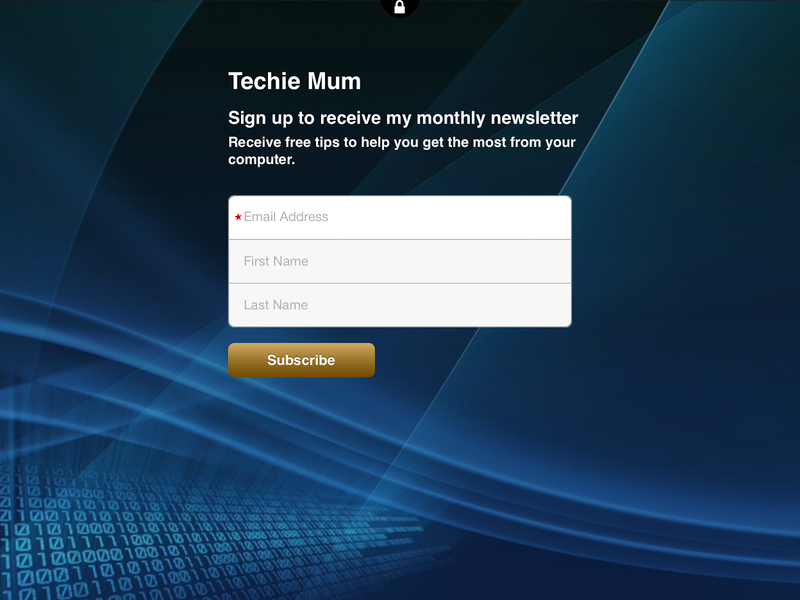 I use Mail Chimp to create and manage Techie Mum newsletters. You can sign up to receive the newsletter from the blog or from my Facebook Page. But there’s often situations where someone would like to sign up for my newsletter but there’s not computer available, or not the time. Chimpadeedoo is a simple app on my iPad and phones that presents a single screen where anyone can signup for my newsletter, regardless of whether there’s internet access. It’s linked to my Mail Chimp account so that once my iPad or phones are able to connect to the internet the registrations are automatically added to my mailing list. Chimpadeedoo is perfect for an exhibition where you could have an iPad on the table for anyone to signup to a newsletter or mailing list (as long as you had a lock on the iPad to prevent someone running off with it) – the app can be set to not go to sleep so it’s always visible. Dropbox is my favourite for cloud storage. Any files that I regularly need when I’m away from my computer are stored in Dropbox, and with Dropbox on my iPad and both phones I can access those files anywhere. On my computer Dropbox appears as just another folder so it’s easy to drag a file to it when needed. I have it set up so any photos I take on my phones or my iPad are automatically saved to Dropbox. That means all my photos are accessible on every device and it sure makes it easy to transfer them into my photo filing system on my computer. As I took screenshots on my iPad and phone for this post they were instantly available on my laptop to add as I was writing. I use the Infinite app on my iPad when I’m planning a new training session. It’s like a board with lots of different post-it notes. I create a note for each topic I want to include in the training and then I can move them around on the board/screen to get the order right. As one of the Virgin Mobile Handset Tester Team I've been trying out the Samsung Galaxy S5 for the last two weeks. If you're interested in the apps I talk about in my review, my next post will be all about them and the other apps I use to manage my business and my life. Disclosure: Virgin Mobile Australia gave me a Samsung Galaxy S5 to review but all views expressed are my own. My new favourite time waster! 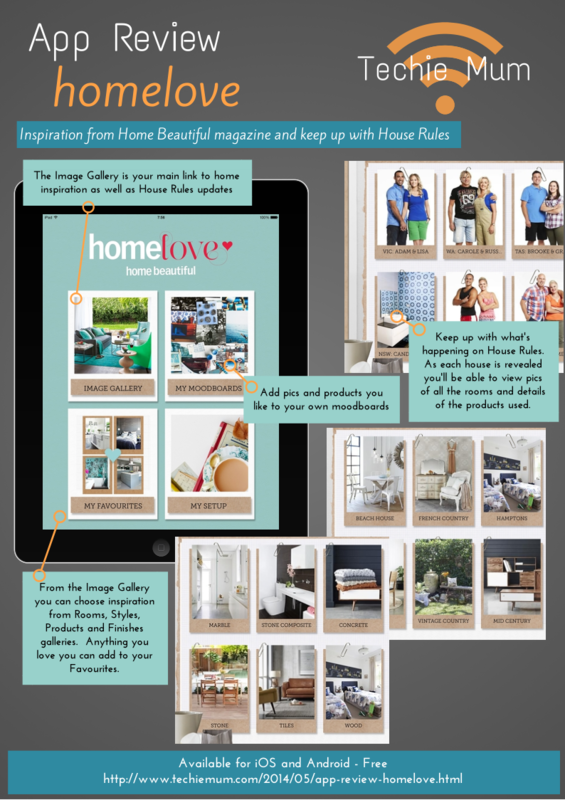 Home Beautiful magazine has introduced an app to help inspire you with your own home renovation and decoration, with thousands of images from the magazine grouped into galleries – Rooms, Styles, Products and Finishes (with more images added each month). When you find an image you love just add it to your Favourites. You can also create your own Moodboards, adding images from the app as well as your own photos from your smartphone or tablet – you could add a photo of the room you’re working on or the furniture you already have as the starting point for your Moodboard. The HomeLove app is also where you can keep up with what’s happening on House Rules. As each home is completed you can view photos of every room and details of the products that were used in the renovation – right down to exactly where to find a particular cushion, tile, lamp or mirror. The HomeLove app is free for iOS and Android phones and tablets. I've got a very special iPhone case for you all today - the InDepth iPhone 5/5S waterproof and weatherproof case. This isn't a pretty case to be left in your handbag – although they do look very smart - these are the toughest cases on the market – especially designed in Australia for the tradesmen, the adventurers and the active people who need a case that can take some hard knocks. This case can take being driven over, taken on a swim, buried in dirt and survive the inevitable drops. 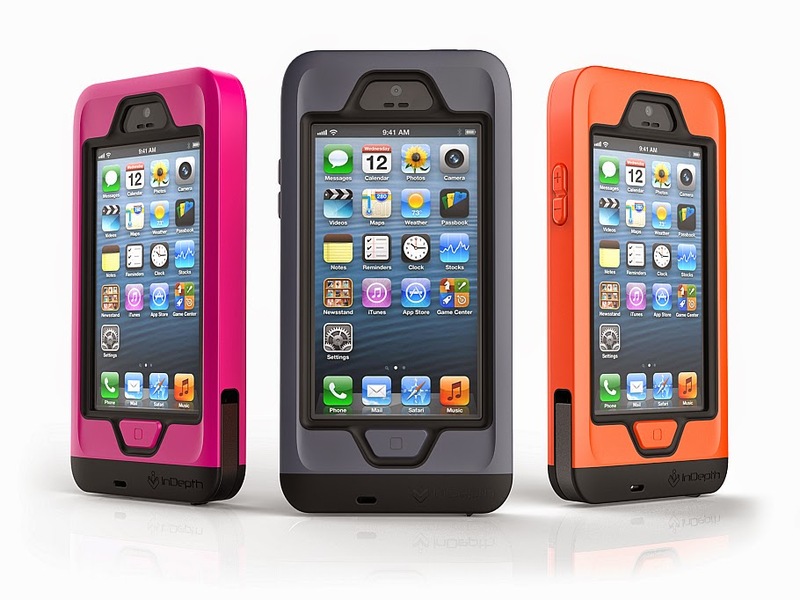 The InDepth case makes your iPhone resistant to water, dirt, impact and snow. 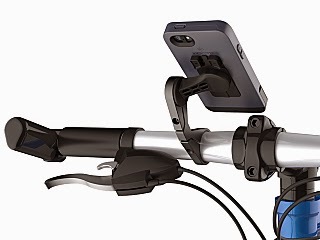 There are also some great accessories that you can attach to the case – a floating lanyard, adhesive mount, bike and bar mount, and a bottle opener belt clip. You can buy an InDepth case here for $99.95 including free Express Post within Australia. There is also an iPhone 4/4S case available for $89.95. Would you like an InDepth case? It’s all very well me telling you about this case, but unfortunately I can’t give it a really good trial – I just don’t think I could be tough enough on it. So, I’d like one of my readers to take on the job of giving it a really good test run – and you get to keep the case too! If you or your partner think you could give an InDepth case a good workout just leave me a comment below telling me what you think makes you (or your partner) the perfect ‘tester’. I'm going to ask the winner to let us all know how the case performed by answering some questions that I’ll provide. I’ll then publish the review (and some pictures, I hope) on the blog. You agree to trial and review this case by answering the questions I will provide – within two weeks of receiving your InDepth case. The winner will be announced on Thursday 8 May 2014 on the Techie Mum blog, Facebook page, and Twitter. The winner will be contacted via the blog or by email address where one has been provided. The winner has four days to reply, otherwise the prize will go to the next best entry. This giveaway has now ended - the winner is Karen Edwards. I will be featuring Karen's review of the InDepth case in the next few weeks. Special Offer - only until 16 April! If you've been hanging around Techie Mum for a while you'll know that I love the Reading Eggs apps. 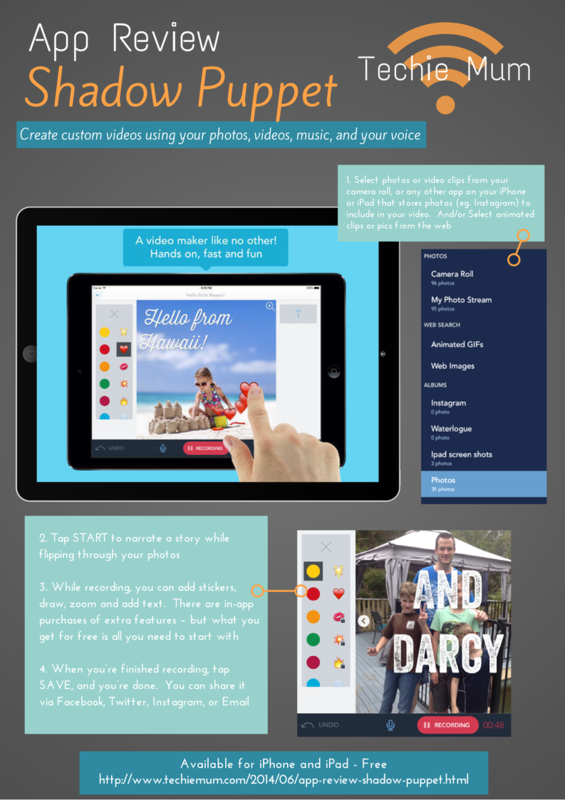 I've used quite a few of these brilliant educational apps over the years for my boys. Adding to the collection is a new maths app – Eggy Subtract to 20. Designed for children aged 4-7 this app teaches subtraction skills using six interactive games – feeding monsters, throwing subtraction pies, snowboarding, helping Teddy climb the rope, finishing Dr Shocks subtraction grid, and a memory game. Within each game there are two or three levels to complete, and as each activity is completed there are rewards to unlock. Reading Eggs apps make learning fun with bright animations and catchy music. 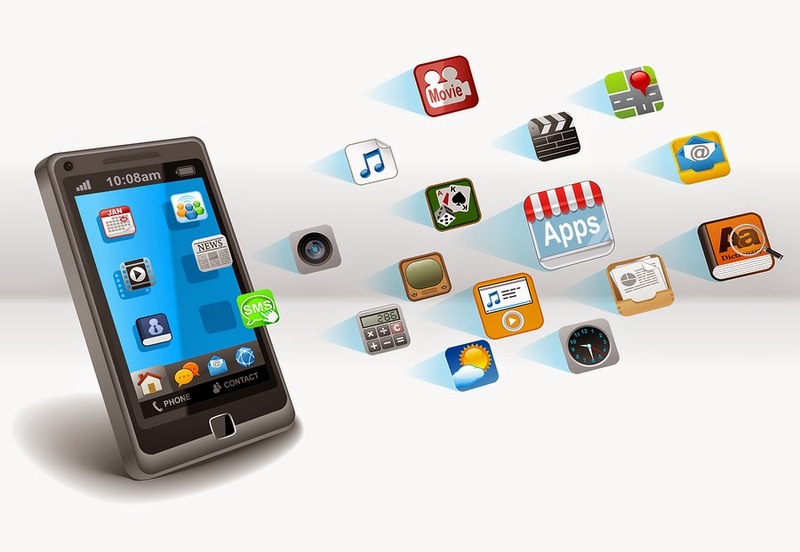 Whilst the apps are created in Australia you have a choice of accents – Australian, English and American. Eggy Subtract to 20 is compatible with iPads and iPhones and is $3.79 from the AppStore. Although you’ll get it a bit cheaper for the next two days. There’s a special offer on just for the next two days (until Wednesday 16 April) – all Reading Eggs apps (except the fabulous Targeting Maths range – damn!) are reduced to $2.49. In October 2001 Windows XP was released and over the years it has become the most used computer operating system in the world. In the 12 years since there have been three new versions of Windows released - Vista, 7, and 8/8.1, but there are hundreds of millions of computers all over the world still using XP – actually 18% of Windows PCs. 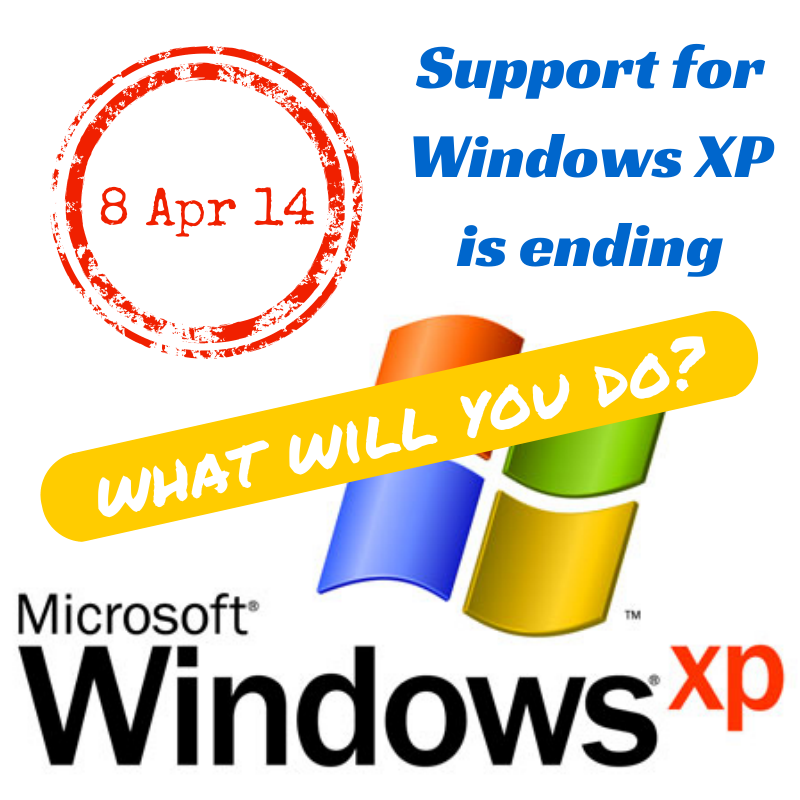 If you’re one of them, you should spend this weekend thinking about what you’re going to do after Tuesday – because on 8 April Microsoft will cease to support Windows XP. While XP is still a great operating system there could be some problems if you continue to use it after that date. What will happen on 8 April 2014? On that date Microsoft will no longer offer any kind of technical support for Windows XP. That means there will be no more automatic updates from Microsoft – of most concern is no more security updates. Support is also ending for Internet Explorer 8, which is the default web browser for XP. 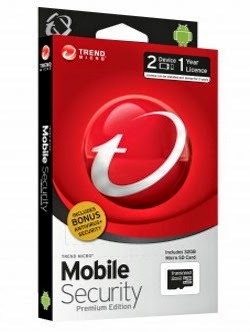 Without those security updates your computer could be exposed to malware, viruses and other security threats. Will my computer still work? Yes, the end of Microsoft support will have no effect how your computer works. If you've been thinking about it, then yes. Now would be a good time to buy. If you've been hearing terrible things about Windows 8, then let me reassure you that it’s not that bad, it’s very fast, and if you bypass the modern tiled start screen there’s a familiar XP/Windows 7 style desktop. It has also been rumoured this week that a future update will reintroduce the Start Menu. Most of the software that you used on your XP computer (unless it’s very old) will still work on Windows 8, or this could be a good opportunity to negotiate with the salesman when buying your new computer to see what software they can throw in - a one year subscription to Office 365 would be good! To help you move your files from your XP computer to a new one, Microsoft has a free tool – PC Mover Express. This tool will copy your files, music, videos, email, user profiles and settings from your old PC to your new computer running Windows 7, 8 or 8.1. If I don’t want to buy a new computer what can I do? Use a more modern web browser – like Google Chrome, or Mozilla Firefox. They are both free to download and will be supported on XP computers until at least 2015. 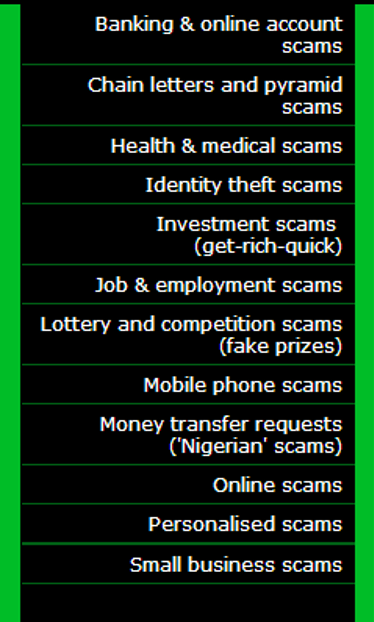 This will help to stop your computer being exposed to the most common threats. If your computer is suitable you could install a new operating system on it - you can still buy Windows 7 installation disks. To check if your computer can run Windows 7 download the Windows 7 Upgrade Advisor. If I buy a new computer is there anything I can do with my XP computer? Yes, you’ll have no problems at all if you are not connected to the internet, so maybe keep it as a backup computer or for the kids for games or basic programs. Have a think this weekend about what you're going to do if you still have an XP computer and if you have any specific questions pop them in a comment below.